On this date in 1941, a quiet Sunday morning on the Hawaiian is­land of Oahu just before 8 o’clock, Japan staged a devious, vicious, un­pro­voked air and naval attack on America’s door­step, the U.S. naval base at Pearl Harbor and its defending Army Air Corps and Marine air­fields that dotted the harbor peri­meter. Twelve days earlier, on Novem­ber 26, over 30 vessels of the Japa­nese First Air Fleet, among them six air­craft carriers with over 420 em­barked planes, left Japa­nese waters on a 3,400‑mile jour­ney for a point 250 miles north of the Hawaiian Islands. The most power­ful carrier task force yet assem­bled sailed into history under the command of 58-year-old Vice Adm. Chūichi Nagumo. 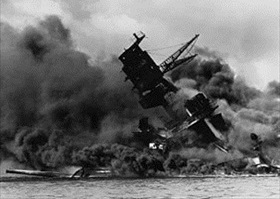 Japan’s spectacular success in the sur­prise attack on Pearl Harbor evis­cer­ated the U.S. Pacific Fleet, removing 60 per­cent of the U.S. Navy’s capital ships from com­bat service in a single morning. By the after­noon of Decem­ber 7, 1941, “a date which will live in infamy” as an enraged Presi­dent Franklin D. Roose­velt called it, eight great battle­ships lay burning or settled on the harbor bottom along­ with 11 cruisers, destroyers, and other ships sunk or damaged. (By sheer good for­tune, the fleet’s air­craft carriers, which soon would play a deci­sive role in turning the tide against Japan at Midway the following June, were at sea.) 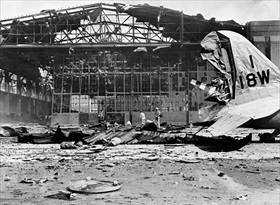 More than 340 Army and Navy air­craft were destroyed or damaged. The Japanese assault on Pearl caused injuries and deaths to over 3,600 U.S. sail­ors, Marines, air­men, sol­diers, and civil­ians, many of them entombed for eter­nity in ships such as the USS Arizona and USS Utah; another 1,178 were wounded. On the Japanese side, losses were modest: 64 airmen killed, 5 ships sunk, and 29 planes destroyed. Japanese leaders envi­sioned a rapid and victo­rious conclu­sion of hosti­lities after inflicting cata­stro­phic losses on America’s Pacific fleet and seizing with relative ease U.S., British, and Dutch holdings in South­east Asia and the South Pacific. The four-month string of tac­ti­cal naval and ground vic­tories dis­suaded an initi­ally cau­tious and conser­va­tive Emperor Hiro­hito (post­humously referred to as Emperor Shōwa) from looking to end the Asia Pacific war through a com­bi­nation of diplo­macy, third-party medi­a­tion, and mili­tary successes to mili­tary successes alone, which suited the Japanese Imperial Navy just fine. However with Japan’s disastrous naval defeat at the Battle of Midway (June 3–7, 1942), what ini­tially appeared as a tem­porary set­back turned into the beginning of a long retreat for Hiro­hito’s navy and its carrier aviation. Of Adm. Nagumo’s six air­craft carriers that parti­ci­pated in the Pearl Harbor attack, four were sunk at Mid­way, the fifth, Shōkaku, in the Battle of the Philip­pine Sea (June 19–20, 1944), and finally Zuikaku in the largest naval battle in history, the Battle of Leyte Gulf (Octo­ber 23–26, 1944), along with 25 other Japanese front-line war­ships. After the Battle of Leyte Gulf ended the offen­sive capa­bility of Japan’s once-feared First Mobile Fleet (Dai-Ichi Kidō Kantai), Ameri­can sailors began mocking the entire Japanese Com­bined Fleet as the “immobile fleet.” It seemed to many observers to be a right­eous come­up­pance to what had been the second most power­ful navy in the Pacific Theater in World War II and the third largest navy in the world after the U.S. and Royal navies. 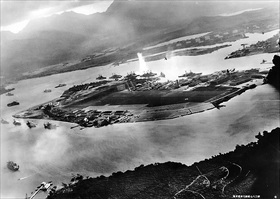 Left: Photograph taken by a Japanese airman of Pearl Harbor’s Battle­ship Row (center in photo) on the east side of Ford Island during the first of two attack waves, one at 7:40 a.m., the other an hour later. The geyser of water is next to the USS Okla­homa. 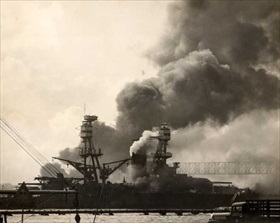 Of eight battle­ships in the harbor, the attack destroyed the USS Arizona, sank the USS Cali­fornia and the USS West Virginia at their moorings, and caused the USS Okla­homa, strucked by nine torpe­does, to cap­size onto her port side, her masts touching the harbor bottom. Over the next couple of days 32 trapped sailors were freed when holes were cut into the hull of the cap­sized ship; 429 crew­men perished. The USS Nevada was forced to beach and three battle­ships were damaged but remained afloat: USS Penn­syl­vania, whose crew managed to fire anti­air­craft weapons and .50 caliber machine guns at enemy planes, USS Tennes­see, and USS Mary­land. Addi­tionally, the two-wave attack severely damaged nine other war­ships, destroyed 188 aircraft, and killed 2,335 U.S. service­men and 68 civilians. The greatest loss of life occurred aboard the USS Arizona, which lost 1,177 sailors and Marines; just 335 men survived the air attack. 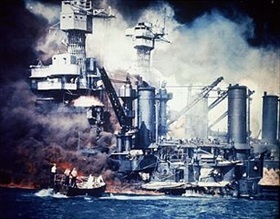 Right: Hit by an armor-piercing bomb, the forward maga­zines of the USS Arizona exploded, sending crew and battle­ship, its keel broken in half, to the harbor bottom 14 minutes after the Japa­nese attack began. The supporting struc­ture of the forward tripod mast col­lapsed after the maga­zine exploded. Those who were blown or jumped over­board on this ship and others who were the target of enemy artil­lery, bombs, and tor­pe­does often swam through thick burning oil, hot, smoke-filled air, and the dead and dying to reach safety. The Arizona burned for two days. Today the sunken ship is a war memo­rial that com­memo­rates the “initial defeat and ultimate victory” of all lives lost on December 7, 1941. 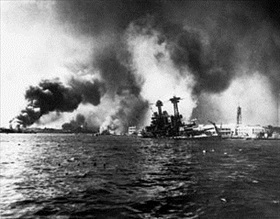 Left: The battleship USS California is seen slowly sinking along­side Ford Island, Pearl Harbor, as a result of bomb and torpedo damage that killed 100 sailors. The battle­ship was able to open fire on the first of the two waves of Japa­nese naval air­craft. The destroyer USS Shaw burns in the floating dry dock in the left dis­tance. The battle­ship USS Nevada is beached oppo­site Hospital Point in the left-cen­ter dis­tance, having lost 60 men in the attack. The California, rebuilt at the Puget Sound Naval Ship­yard in Wash­ing­ton state, returned to service in Janu­ary 1944, the Shaw in June 1942, and the Nevada in October 1942. Right: The battleship USS West Virginia took two aerial bombs, both duds, and seven tor­pedo hits, one of which may have come from a Japa­nese mid­get sub­marine. Sailors in a motor launch are pic­tured rescuing a sur­vivor from the water along­side the sunken ship during or shortly after the attack, which killed 106 men. The West Virginia returned to service in July 1944. She was the only Pearl Harbor sur­vi­vor to take up station in Tokyo Bay the next Septem­ber when Japan signed the sur­ren­der docu­ment. The battle­ship USS Tennes­see, which lost five sea­men in the attack, is visible behind the West Virginia. The Tennessee returned to service in February 1942, rejoining the fleet in June. Left: Admiral Husband E. Kimmel’s flagship, the World War I era battle­ship USS Penn­syl­vania, can be seen in Dry­dock No. 1 behind the wrecked destroyers USS Downes and USS Cassin at the Pearl Harbor Navy Yard soon after the end of the Japa­nese air attack. The Cassin, which had had part of its hull removed for dock work, capsized against the Downes. 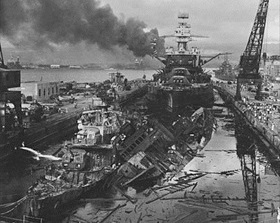 The torpedo-damaged crui­ser USS Helena can be seen in the right dis­tance beyond the crane. In the cen­ter dis­tance is the cap­sized Okla­homa with the USS Maryland along­side. The smoke is from the sunken and burning Arizona, out of view behind the Penn­syl­vania. The California is par­tially visible at the extreme left. The moderately damaged Penn­syl­vania, which lost several dozen men while fending off enemy air­craft with anti­air­craft fire, under­went imme­di­ate repairs at the Puget Sound Naval Ship­yard and was over­hauled in San Fran­cisco’s Mare Island Naval Ship­yard. The war­ship returned to active service in March 1942. She ended service in July 1946 as a target ship during the atomic bomb tests at Bikini Atoll. Right: Hit by six bombs and one torpedo, which killed 60 men, the World War I battle­ship USS Nevada is seen attempting to escape from the har­bor. The crew beached the ship, which, after repairs and exten­sive modern­i­zation at the Puget Sound Naval Yard, returned to service in October 1942. Left: Japanese aircrews bombed and strafed Navy air bases at Kaneohe Bay and Ford Island, in the cen­ter of Pearl Har­bor; Army Air Corps fields at Bellows, Wheeler, and Hickam (shown here); and the Ewa Marine airfield. A total of 188 aircraft were destroyed and 159 damaged. 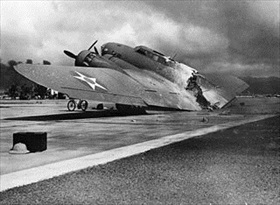 Right: A destroyed U.S. Army Air Forces Boeing B-17C Flying For­tress rests near a hangar at Hickam Field, Decem­ber 7, 1941. Flown from Cali­for­nia to Hickam en route to Del Monte Field on the Philip­pine island of Mindanao, it arrived during the attack. On its final approach, the air­craft’s magne­sium flare box was hit by Japa­nese strafing and ignited. The burning plane separated upon landing. The crew survived the crash.